It clearly too late to take preemptive action against wireworms for this year. If you suffered insect damage to your corn this spring, it is a good time to identify the culprit and make plans to avoid it next year. Last year at least one farmer I know made the decision to replant all or part of a field due to damage caused by wireworms. 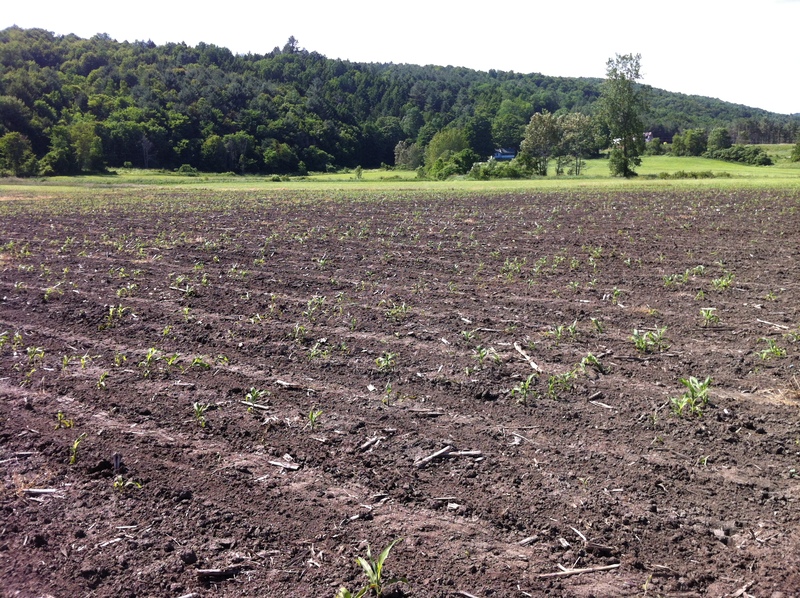 In this case, the corn had been planted using no-till equipment but was developing very slowly due to the local growing conditions. Eventually, the farmer noticed that many of the plants were dying outright. Upon closer inspection we discovered feeding patterns at the base of the corn seedling that are characteristic of wireworms. What are wireworms? Wireworms are the larval form of the ‘click beetle.’ This insect pest has a life cycle that varies in length from two to seven years, depending environmental factors. The larvae are hard-bodied, range in length from 0.25 to 1.5 inches long, and range in color from white at the youngest stage to a rusty-orange color at the later stages. A field with wireworm problems will typically have wireworms at many or all stages of development in a given year. Where is wireworm damage likely to occur? Wireworms are attracted to germinating seeds and decomposing plant material. In fields that have recently been in rotation with a perennial forage crop, wireworm populations will be higher. Fields and certain areas within fields are at a higher risk from wireworms if they are weedy, wet, have high organic matter, are narrow (i.e., field edges are relatively close), or have a recent history of perennial sod or cover crops. Due to the lack of physical disruption of the larvae, no-till fields are also at a higher risk than conventionally tilled fields. What does wireworm damage look like? Wireworms feed below the soil surface and will attack seeds before, during, and after germination. After emergence, the most visible damage occurs at the base of the plant where the wireworm seems to target the growing point. Until V6 the growing point of corn is at or below the soil surface and therefore vulnerable to the wireworm and other pests. After this stage, the risk of yield-damaging wireworm damage seems to diminish rapidly. How can it be prevented? Wireworm problems are more common in fields that have had a sod or cover crops recently and in no-till situations. Tillage significantly disturbs the larvae and is the only means of control in organic systems. Problems can be reduced in organic systems by avoiding early planting. While germinating corn seeds are at risk, corn seedlings that emerge and just ‘sit there’ during cool/wet/cloudy conditions are very vulnerable to wireworm damage and secondary pathogens that capitalize on damage caused by them. Using slightly higher seeding populations is another way to partially offset the impact of wireworm damage. The effectiveness of this strategy will be somewhat mitigated by the fact that wireworm damage tends to be patchy within a field rather than evenly distributed throughout. There are few if any predators, parasitoids known to be strategically useful for controlling wireworms and none of the Bt traits used against corn rootworm provide any control of wireworms. Some research in potato production suggests that there may be some entomopathogenic nematodes that play a role in controlling wireworms. What are some management options? Most conventional corn seed is purchased pre-treated with Cruiser or Poncho insecticide. These insecticides provide protection to the seed from direct insect contact and systemic protection to the plant from insects that may feed on them. In some years when farmers plant early and/or the growing season otherwise starts slowly, the insecticidal treatment can run out (due to decomposition or dilution) and the plants can again become vulnerable to attack. The first picture (above) is from a Central Vermont farm that had a severe infestation of wireworms early in the 2012 growing season. The damage to the field was extensive enough that the farmer decided to replant the field. After the field is planted, there is nothing that can be done to treat wireworm problems. If you have crop damage due to wireworms this year, it is important to understand why so that you can take appropriate management steps for next year in that and other fields. Most non-organic corn seed comes pretreated with some formulation of Cruiser (thiamethoxam) or Poncho (clothianidin) insecticides, both of which are neonicotinoid insecticides and are effective against wireworms. A high rate of these seed-applied insecticides is 1.25 mg/seed, which equates to about 1.54 ounces per acre; the low rate is 20% of that amount. These products are systemic, which means that the compound is taken into the plant tissue and susceptible species of insects that try to eat the plant will be eliminated if it is within the window of control (one to three weeks after crop emergence). This class of compounds is neurotoxic to susceptible insects and works against target pests by binding to nicotinic acetylcholine receptors; These products have comparatively low toxicity in mammals, which is why it has they have been so favored in recent years. More direct handling of pesticides in forms that are likely to increase human exposure. But there is some controversy! Whether neonicitinoids are harmful to bees in the concentrations at which bees are likely to be exposed and in ways that bees are likely to be exposed. Whether doses that are sub-lethal (in the short term) have deleterious effects on bees in the mid- and long-term that would affect the viability of the individual bee or the hive. Whether these pesticides impact bees in ways that are not typically expected that may be otherwise contributing to CCD. Gray, M. 2010. Secondary corn insects: how significant is the threat? The Bulletin. No. 3, Article 1. University of Illinois Extension. Online: http://bulletin.ipm.illinois.edu/print.php?id=1279. Kuhar, T.P., Doughty, H. B., Speese, J., and S. Reiter. 2009. Wireworm pest management in potatoes. Virginia Cooperative Extension. Online: http://pubs.ext.vt.edu/2812/2812-1026/2812-1026.html. Szczepaniec, A. 2013. Scouting for wireworms in corn. In iGrow (SDSU). 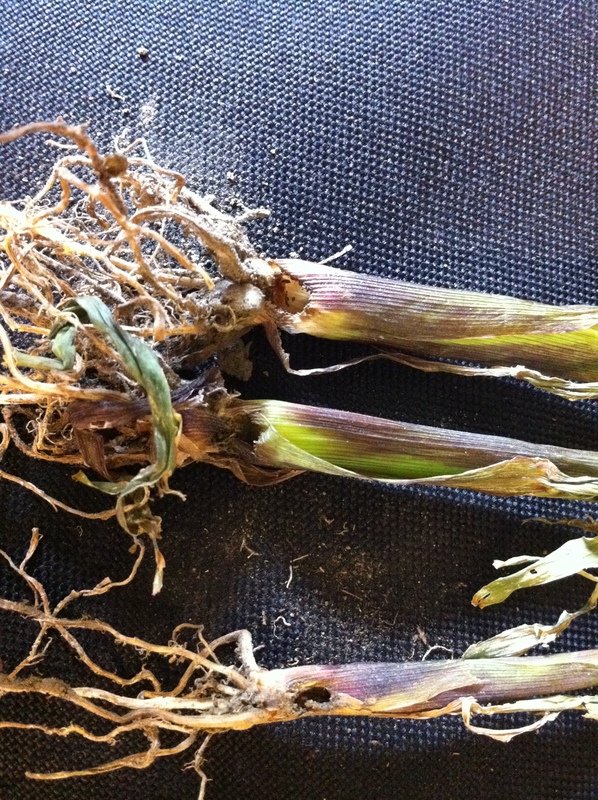 Online: http://igrow.org/agronomy/corn/scouting-for-wireworms-in-corn/. Van Duyn, J. 2005. Organic Insect Pest Management: Field Corn. In Organic Field Crop Production and Marketing in North Carolina. North Carolina State University. Online: http://www.organicgrains.ncsu.edu/pestmanagement/corninsects.htm.